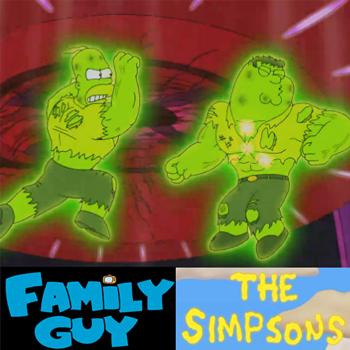 For 25 seasons, The Simpsons have only ever participated in one official crossover episode (with The Critic.) But this fall, they'll meet up for the first (canonical) time with Family Guy's Griffins for their season premiere. The first sizzle-reel trailer for the episode debuted this afternoon at SDCC, and now Entertainment Weekly has debuted the footage as an online exclusive. In the special hour-long episode, The Griffins become sidetracked and find themselves in Springfield, where they make fast friends with The Simpsons based on their obvious similarities. But said similarities threaten to tear Peter and Homer apart when an argument over accusations that Peter's beloved Pawtuckett Patriot beer is nothing but a lesser knock-off of Homer's equally-beloved Duff (Peter: "It may have been 'inspired by' Duff, but I'd like to think it goes in a different direction." - GET IT???) escalates into a citywide brawl. Also glimpsed in the footage: Bart and Stewie have... "different" interpretations of a prank phone-call, and Peter teaches Homer how to do a cutaway gag. Simpsons Guy Will actually be the first of two crossovers for the iconic animated family - a subsequent November episode of their own series, titled "Simpsorama," will see them encounter the time-traveling cast of Futurama. In addition, August will see the debut of The Simpsons in cable syndication on FXX, beginning with a record-breaking 12-day marathon of all 552 episodes and the launch of the Simpsons World app, which will stream not only full episodes but also clips searchable by character, quote and keyword.